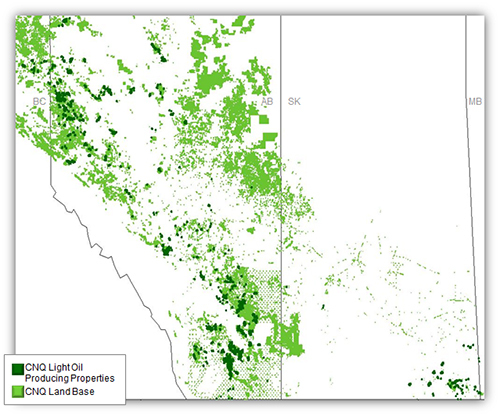 Canadian Natural produces light crude oil and NGLs in all of its western Canadian core regions. The majority of these pools are mature but recovery factors are still modest. The majority of Canadian Natural’s light crude oil pools are produced under waterflood which provide relatively high ultimate recovery factors with low production decline rates. All of these projects are low-risk but do require rigorous geological and engineering analysis in order to be successful. Although the basin is mature, new pool development remains part of our light crude oil strategy. Our extensive undeveloped land base continues to deliver new pool discoveries through detailed geophysical and geological analysis. Our light crude oil pools have recovered approximately 30% of the original oil in place, leaving a significant resource target. The availability and development of new technology leads to improving recovery factors, adding significant leverage to Canadian Natural. We are currently testing various enhanced oil recovery processes that include waterflooding, CO2 flooding, polymer\flooding and alkaline surfactant polymerflooding. All of these technologies show promise. Canadian Natural’s light crude oil drilling and development programs continue to pursue several initiatives within Western Canada. The Company efficiently executed on low-risk, infill and step-out drilling in crude oil pools located in the core regions of Northern and Southern Plains, Northwest Alberta, Northeast British Columbia and Southeast Saskatchewan. Canadian Natural’s strong technical teams continued with waterflood optimization programs through detailed reservoir characterization and analysis. Enhanced Oil Recovery has made significant progress, resulting in value-adding commercial projects.